Like so many across our country yesterday, I was captivated by the live news coverage of the out-of-control helium balloon that supposedly was occupied by six-year-old Falcon Heene. I listened to coverage about height, speed, trajectory, temperature, and so on. I watched it land. I watched the kid not be there. I tweeted about it. Then I watched the kid possibly suggest it was for show on CNN and then vomit on the Today show. I also read this great commentary from NPR. The whole Balloon Boy fiasco got me thinking about religion, and honestly, the way the country reacted to the initial story and then the fallout seems to be an important lesson for those of us trying to help more people understand atheism. First, we saw something fantastical. Here is this bizarre looking balloon flying through the air out of control. It was probably a very similar wonderment to what the Apostles experienced witnessing the supposed “miracles” Jesus performed. On top of this unique vision we were having, we also heard that there was a six-year-old kid on board the strange craft. And what’s most important about this is we had no reason to doubt it. There seemed to be no evidence that the kid was anywhere else and all we had to go on was what he heard from the family. From an evolutionary instinct point of view, it makes sense that we all believed he was on the balloon because better that we were trying to care for and protect him (at a subconscious level at least) without hard proof than had we ignored what could have been a very sad tragedy. 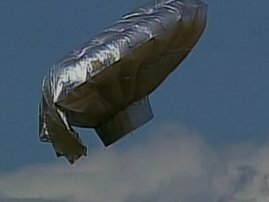 I know that as we watched the balloon descend and saw the police officials ripping into it, there was a sense of, “This is the moment of truth. This is what it has all led up to.” And when Falcon was not there, the balloon lost its wonderment, because it was no longer a source of mystery. And then look at how the entire country responded to the fact that Falcon was just hiding in the attic over the garage. People were angry and upset. Was this a hoax? Is this family a group of attention-craved whackos? The reactions were very negative. Everything that we had believed for those hours of news coverage was for not. Personally, I didn’t really care. Perhaps my atheism and skepticism has sunk in pretty deep, because my honest reaction was to delight in the truth. I thought the whole thing turned out to be pretty dumb, but I didn’t feel a negative reaction that I had somehow been “fooled.” For me, it was just recognizing what I knew and didn’t know (and when I knew or didn’t know it) and moving on from that. But I think the fact that so many have had very negative reactions is, in a way, telling of why people are so anti-atheism. It’s not just that they don’t understand this different way of thinking, but that they don’t want to. It’s more captivating to think that Jesus really did perform all those miracles and rise from the dead. To show them that Jesus was really just hanging out above the garage would be devastating. That’s why I think just being “anti-religion” or “antitheistic” isn’t enough. We can’t just say religious beliefs are wrong and unfounded. We can’t just show the arguments for why such beliefs are foolish or delusional. We also have a responsibility to help people understand why they believe what they believe and why they think about life the way they do. Only then can we help them move to understanding why those beliefs are not the most intellectual ideas. I think that’s really what critical thinking is all about and why conversations about religion are so “difficult.” It’s because of how personally attached people are to them. So, let us learn a lesson from Balloon Boy. It is extremely easy for us all to be captivated and excited by things we do not understand, so much so that they capture our attention for an entire afternoon or even a lifetime. We have to understand why we feel that way, and when the cold hard evidence is revealed or presented, we have to remember how to help people with how they feel in addition to what they learn.